Ever feel like you have too many business cards lying around. Even if you have them organized, losing them can be devastating because the contacts are so crucial at the time. 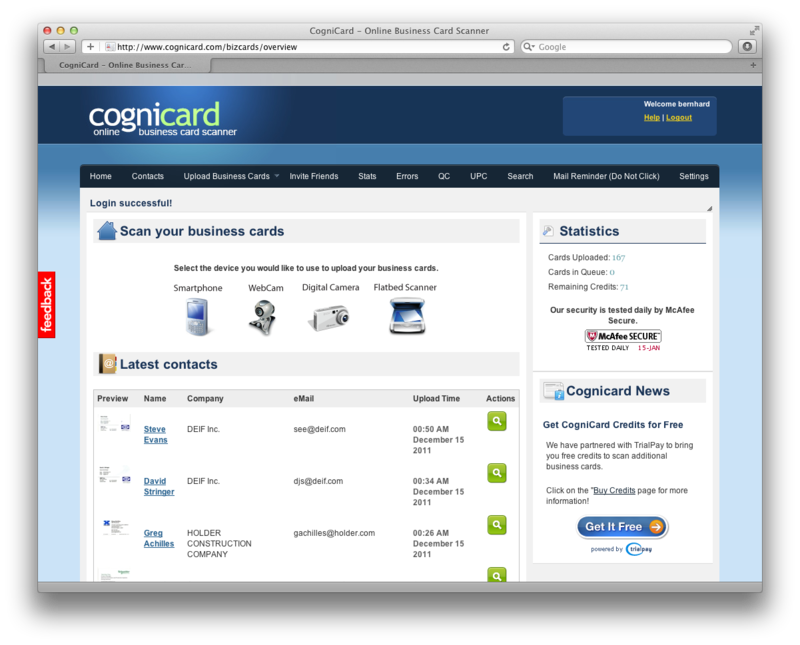 There is a way to keep your business cards in check and organized as they should be with Cognicard. 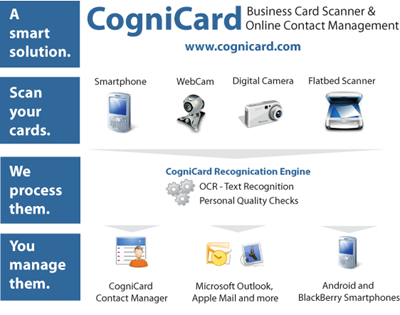 Cognicard can be as easy as taking the business card from the person and heading to your computer, take a picture or use your phone to save it. This gives you the chance to have your library of business cards in a space-saving and eco-friendly way. Having your business cards organized will also provide you with the chance to look up business cards as if you were using a search engine. This option is great for people who are interested in networking and need a place to store business cards. Having to look at thousands of resumes on paper is enough for people to have to deal with. 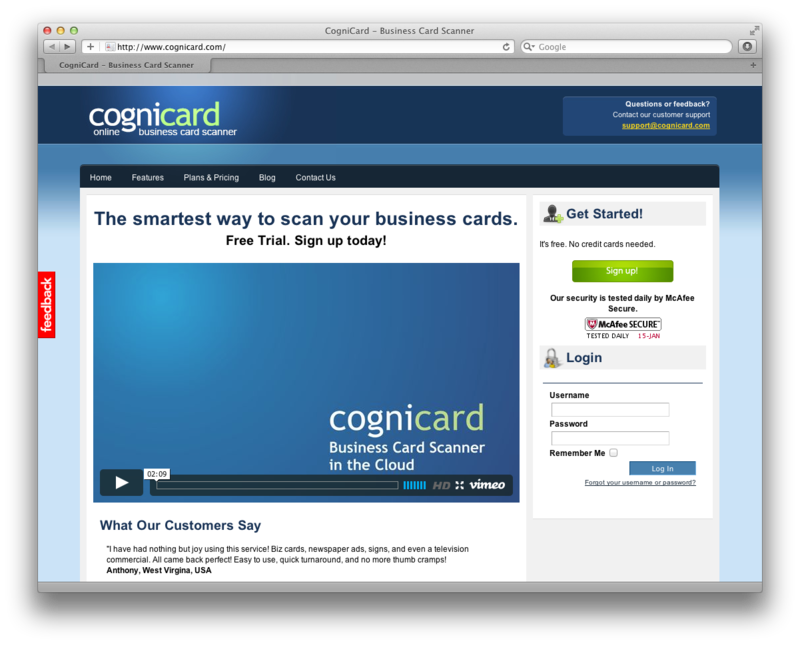 You may already be asking yourself if you can deal with a service like Cognicard, knowing that there are better ways to scan your business cards out there. The great thing about Cognicard is that they provide integration with programs such as: Outlook and LinkedIn. You also get Facebook integration to look up for the cardholder. Every avid worker has to have their own Blackberry in order to stay in touch with the company, so Cognicard decided to provide Blackberry integration to this application as well. 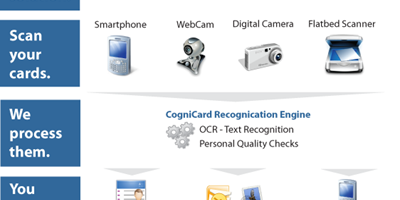 Cognicard ( business card scanner outlook ) can read any kind of funky font, and this software works with every type of webcam or camera device out there right now. There is no need for any special equipment, installations or anything else but the webpage access. If a business card has too much design and the letters seem to be fading into the background, the software can recognize the missing letters right away with text prediction. If you’re one of those traditional people who prefer to use flatbed scanners, you can easily scan the pictures from your hotel, workplace or any store that has one. You can also use your smartphone or your digital camera to save business cards, which is great for people who want to do things instantly on the spot. Any smartphone works with Cognicard, whether you have and Android, an iPod, iPad, iPhone or Blackberry. As you take the picture, all you have to do is send it to your Cognicard email address in order to add the business card into your library. Cognicard does the rest by sending you an email with the VCF file, which you import to your address book on your smartphone. In short, there’s no need to exchange digits if you have the business card. As for the pricing plans, you basically choose from a range of packages and you can use the free trial, which allows you to scan three business cards for you to see if you are satisfied. These free credits will never expire, so you can choose to use them at any time. The best thing about Cognicard is that you pay only when you verify that the quality of the business card upload to the website is the best. The individual plan is worth nine dollars, which includes credits for thirty business cards. The Business plan includes 75+20 credits which is a total of 95 credits. The professional plan is worth twenty nine dollars and it includes credits for one hundred and fifty business cards. All these credits will never expire, so you can buy the professional plan and use it until your credits run out. You can easily save up to five hours of your time!